“I always try to be as honest as I can in the songwriting. Otherwise there’s no point in doing it: I might as well be doing an advertising job or something,” Country Music Hall of Fame inductee Kris Kristofferson says. In the 1970s, Kristofferson became a fixture on the country music landscape, penning hit classics such as “Me and Bobby McGee” (Janis Joplin), “Help Me Make It Through the Night” (Sammi Smith), Johnny Cash’s “Sunday Mornin’ Comin’ Down,” and Ray Price’s “For The Good Times.” The gospel-imbued “Why Me,” featuring vocal support from Rita Coolidge and Larry Gatlin, peaked at no. 1 on the Billboard Country chart in 1973. In 1985, along with music stalwarts Johnny Cash, Waylon Jennings, and Willie Nelson, he formed The Highwaymen, with critical success following. While his acting career since the 1980s exceeded the output of musical material, he continued scoring hits into the 21st century with This Old Road (2006) and Closer To the Bone (2009), augmented by the musical talents of luminary drummer Jim Keltner and record producer and bassist Don Was, of Was (Not Was) fame. 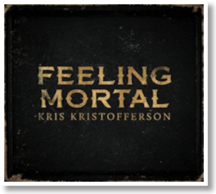 Now 76 years old, Kristofferson has released his latest album Feeling Mortal. In a musical career of over four decades--including having his work recorded by greats such as Jerry Lee Lewis, Elvis Presley, Frank Sinatra and Sammy Davis, Jr.--Feeling Mortal strengthens this artist’s legacy as an honest, observational, and thoughtful musician who can thread country music and folk music into convincing compositions that appeal to different tastes. The simple message here is that while humans are mortal, the power of legacy, of memory and achievement, can last a lifetime. 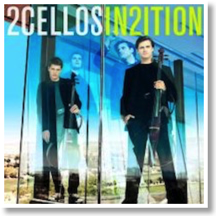 As blooming superstars on nearly every platform, 2CELLOS seemed to have appeared overnight in 2011 and quickly began to take the world by storm. For the Croatian duo, Luka Sulic and Stjepan Hauser, worldwide recognition began on the little website called YouTube.com. After uploading their original and creative arrangement of Michael Jackson’s “Smooth Criminal” on two cellos, their music went internationally viral, garnering millions of views in a matter of days. In that same week, the duo were signed to Sony Masterworks and invited to tour the world with music legend Elton John. They would make appearances on popular TV shows such as The Ellen DeGeneres Show, The Tonight Show with Jay Leno, Lopez Tonight, and GLEE. The album displays Sulic and Hauser’s flexible and diverse ranges of performance expertise. The beautiful and mellow melodies of “Benedictus” contrast starkly to the electric, rock ‘n’ roll feel of “Highway to Hell.” Additionally, their arrangements work perfectly around the guest musicians that are featured in the tracks as the cello melodies and sounds mesh in and out with grand piano, pop vocals, guitar, and a plethora of other sounds. The two cellists redefine the meaning of duet as their personalities give both their covers and original compositions the flair and complexity that makes their music engaging. Although many of the pop songs that they cover are cyclical in nature, they stylistically embellish and add depth to each iteration, making many of these covers feel like a breath of fresh air. Combining innovation with refined, practiced technique, 2CELLOS offers an exclusive sneak peek into what may be the future of cello music. Half of the album’s tracks are taken up by Ax’s recording of Beethoven’s Variations and Fugue for Piano in E-flat Major, Op. 35, otherwise known as the “Eroica Variations” because of the shared theme between the Variations and Beethoven’s Symphony No. 3 in E flat major, Op. 55, called “Eroica.” Despite the large number of separate variations in this collection, Ax finds a way to connect all of the tracks with sophisticated and creative phrasing techniques so that they are presented to the listener as if it were one breath giving way to another. Similarly, Haydn’s Variations for piano in F minor are strung together under Ax’s hands in a storytelling fashion as Ax’s expertise in Romantic music comes into play. The harmonies are absolutely stunning and simply an impressive feat. Finally, the Schumann Symphonic Etudes exhibit Ax’s technique and mastery of the instrument. He takes on some extremely challenging runs with ease throughout the tracks; this pianist’s control of the music must be heard to be believed. Exclusively for digital download purchasers of the album, there is a bonus track of Copland’s Piano Variations. 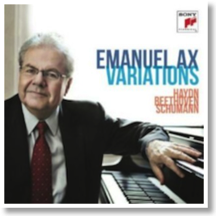 Although Emanuel Ax is hardly the first solo pianist to have taken a look solely and specifically at the variation form, Ax undoubtedly creates a unique and well-executed platform from which to have a conversation about musical style, structure, expression, and the art of bringing music alive outside of the typical, well-rehearsed sonata discussions. Arguably one of the most popular violinists of his time, Grammy Award-winning musician Joshua Bell has become a familiar name among classical artists, students, and enthusiasts around the world. Through his talent, charisma, performance, and virtuosity, Bell has picked up the remarkable nicknames of the “poet of the violin” and a “classical music superstar.” He has recorded over 40 CDs and has appeared numerous times on television including The Tonight Show and Sesame Street. His most recent musical feat has been as the appointed music director at the Academy of St Martin in the Fields; the 2013 Sony Classical album title, Joshua Bell Conducts Beethoven Symphonies No. 4 & 7, explains it all. 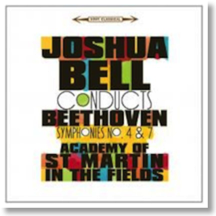 In these recordings, Bell acts as both conductor and concert master for what Bell claims are two of his favorite symphonies. Both the fourth and the seventh symphonies are significant pieces in Beethoven’s portfolio. They were composed six years apart and each has its own unique feel when put in conversation with the other as they are in this album. The fourth symphony starts in B-flat minor and builds up a thick and rather ominous atmosphere over the first half of the symphony. The recapitulation in the first movement features a significant crescendo that Bell executes absolutely magnificently; the build-up feels impossibly powerful, and the moment of recognition is perfectly clear as the music bursts into the main theme again. In the third movement, light and joy seep into the notes as the tune turns more optimistic. The symphony ends the fourth movement with great melodic excitement. The seventh symphony has a very different tone. It feels very celebratory and rhythmic in contrast to the moodier fourth symphony. Even the slower sections have a definite undercurrent driven by rhythmic beats. After the symphony’s debut in 1813, Richard Wagner even dubbed the work “the apotheosis of dance” due to the pervasiveness of rhythm throughout the symphony. Bell directs this piece with precision through all of the whirling melodies, finishing the album with an ecstatic air of satisfaction. The Academy of St Martin in the Fields puts on a spectacular performance in this recording, and the musicians’ talent and expertise shine in this special situation in which the director is the concert master, and the first violin section leader is the conductor.